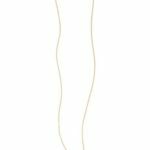 Sparkly Earrings: A Little Holiday Decor for You! All right, ladies! Have I got a deal for you today!!! I’ve had TONS of e-mails (like probably close to 40-50) over the last 6 weeks asking about where to find the glitter studs from the junior’s department at Nordstrom. Everybody that had e-mailed me remembered giving them for teacher gifts the last couple of years on the cute little Christmas tree cards that my friend Andrea designed…and people were wanting to do the same this year. Everybody was so disappointed that they were no longer available! When I told them the BP studs were gone, they asked for options, but the only option I had was the Kate Spade glitter studs. Sadly, the Kate Spade studs are of course quite a bit more expensive that the BP version ($32 for the mini and $38 for the large), putting them out of range for many for teacher gifts (especially those with multiple kids and multiple teachers). In addition to the expense, the colors are now very limited in the Kate Spade version and have been for quite awhile. WELL! I’VE GOT GREAT NEWS FOR EVERYBODY! TODAY I’VE GOT A NEW OPTION FOR YOU! My girls at Accessory Concierge came through for us! 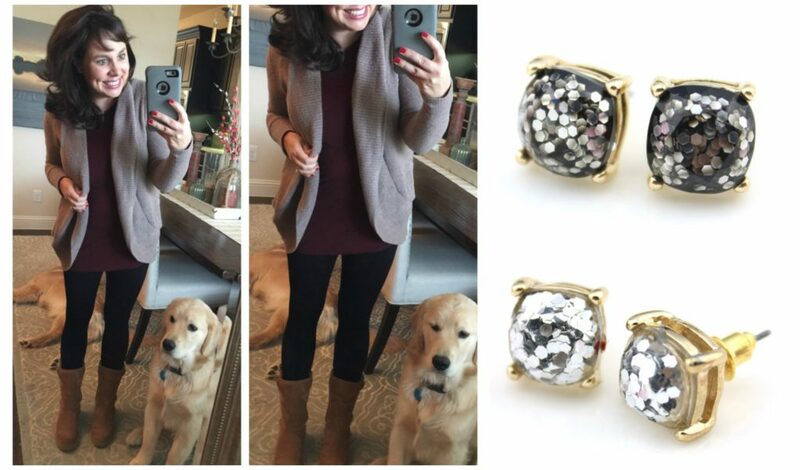 Check out these GORGEOUS GLITTER STUDS! LOOK HOW SPARKLY THEY ARE!!!! If I had to pick my favorite 3 colors, I would say the silver, the pink multi color, and the aqua. Although I really love the micro silver glitter and the gold too. Truly, I love them all. They are absolutely beautiful in person. There are 11 different color options, so there’s sure to be something for everybody! They are smaller than the BP studs, which I know most of you will be excited about! The biggest complaints I received about the BP studs is that they were “too chunky” and that the posts were “too long”. Well, these aren’t as chunky AND the posts are shorter. I call that a #winwin. Here’s the FABULOUS, AMAZING, GENIUS idea that everybody is going to go CRAZY over…. My friends at Accessory Concierge and I started talking about an idea for teacher gifts several weeks ago, so they asked their graphics department to cook up an idea for gifting. And what was created is wayyyyyyyyy cuter and wayyyyyyyyy more clever than I ever could have imagined. HOW. DARLING. IS. THIS. And how proud would you be to gift this to somebody? I think the entire presentation looks so festive and polished! 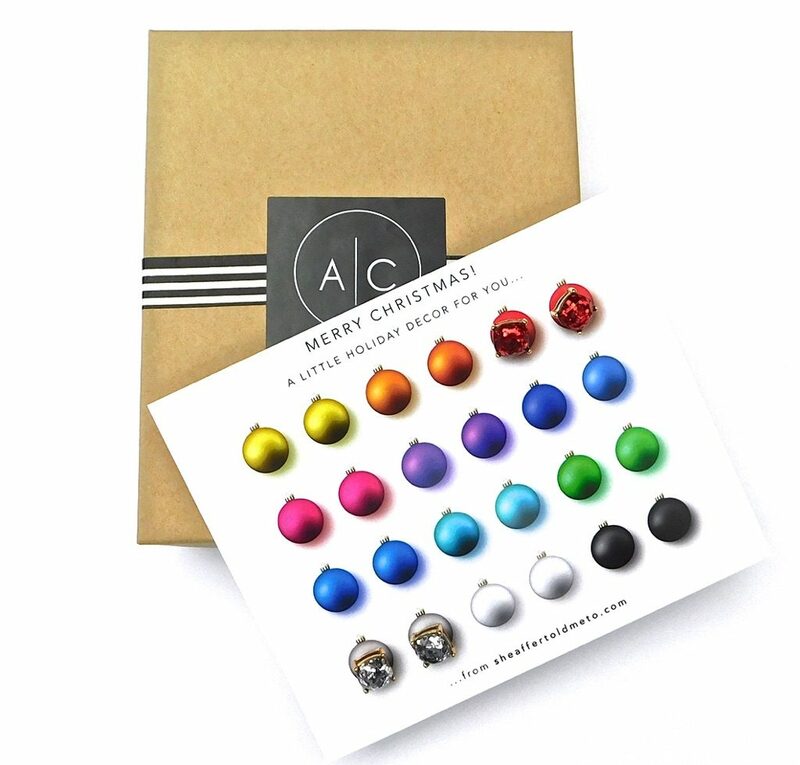 The graphic is fun and colorful, I think “A LITTLE HOLIDAY DECOR FOR YOU…” is just so clever, and the earrings look great punched through the ornaments! I MEAN! SO STINKIN’ CUTE! UPDATE as of 6:00 a.m. Wednesday morning: The code is only working right now for $13 off the total (instead of $13 off each pair of earrings), but they are working on fixing it right now! I’m hopeful the fix will happen very soon!!!! UPDATE as of 7:20 a.m. Wednesday morning: The code is now working!!! YAY!!! 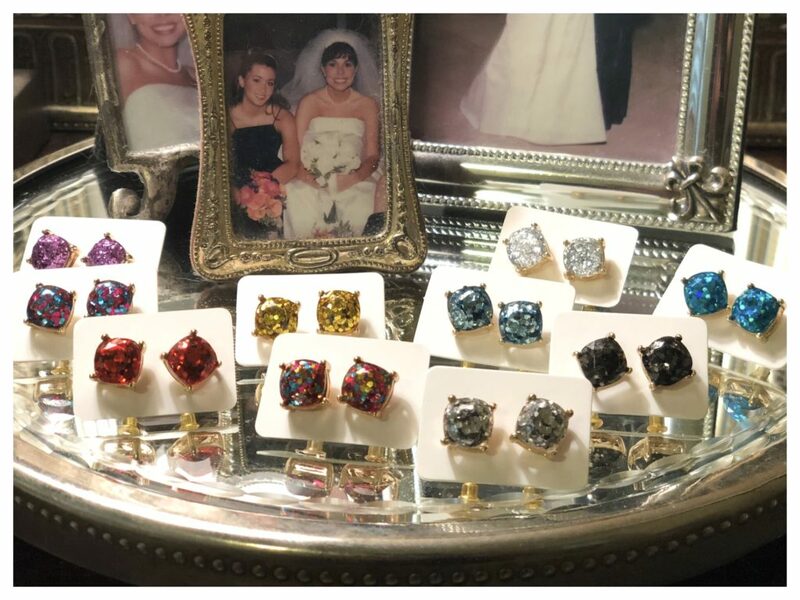 With the code STMTglitter, you can get the following for ONLY $13: a pair of earrings (you choose the color! 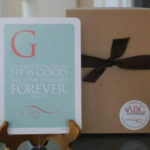 )….the DARLING card with the graphic…and the box (TOTALLY READY FOR GIFTING)!!!!! The code is good until Thursday night at midnight. This is an outstanding deal considering that without the code, the earrings alone are generally $26! And the standard shipping of $6 applies for as many earrings as you want to order. You can buy 8 pairs of earrings (and request 8 cards and 8 boxes), and you’ll still just pay one flat $6 shipping fee for all 8 gift sets. And think about it! You don’t have to print anything off (if your printer is anything like my printer, it often doesn’t work…is out of ink….etc. ), you don’t have to buy a bag, you don’t have to arrange tissue paper (that NEVER ends up looking good anyway), you don’t have to leave the house, and most importantly…you don’t have to think about what they heck you are going to give anymore! So, your teacher gifts are DONE! Who else would these little boxes be great for? Think Co-Workers! Besties! Sisters! Your Hair Girl…and the list goes on!!! I really can’t think of anybody who wouldn’t love to receive this as a gift! And don’t forget the specials teachers (art, p.e., music) or therapists (speech, ot, pt) that are often forgotten! For $13 you can treat everybody! 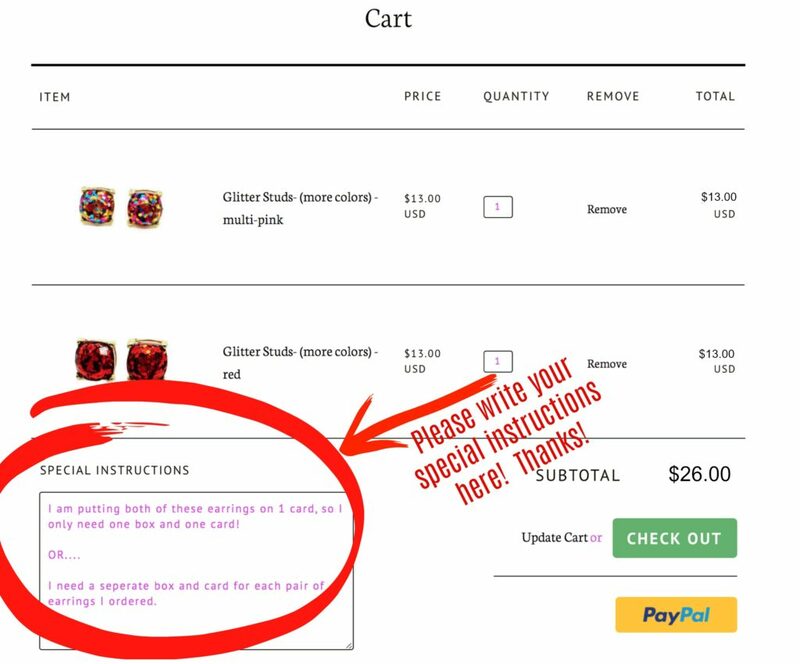 The above “special instructions” box appears after you place the earrings in your cart and GO TO YOUR CART. Please make sure you notate how many boxes you need. We really don’t want to be wasteful with the boxes and have them just be thrown away if you don’t need them. THANK YOU! And girls, I really love these earrings. I am going to be so excited to gift these little earring packages this year! Don’t forget to use the code STMTglitter to reduce the price from $26 to $13!!! I love the size of these more than last year’s BP ones, and I love the color options and the price way more than the Kate Spade option. I wore the silver ones to the OU/TCU game over the weekend, and they were very comfortable the entire day. In fact, I didn’t even have to take them off to talk on the phone, and I have to do that often. Before you go today, I thought I would give you some ideas of outfits to wear with these studs. These are outfits you’ve already seen on the blog..and many of you probably already have 1 or 2 of the pieces….and now you can see what studs look good with the outfits! 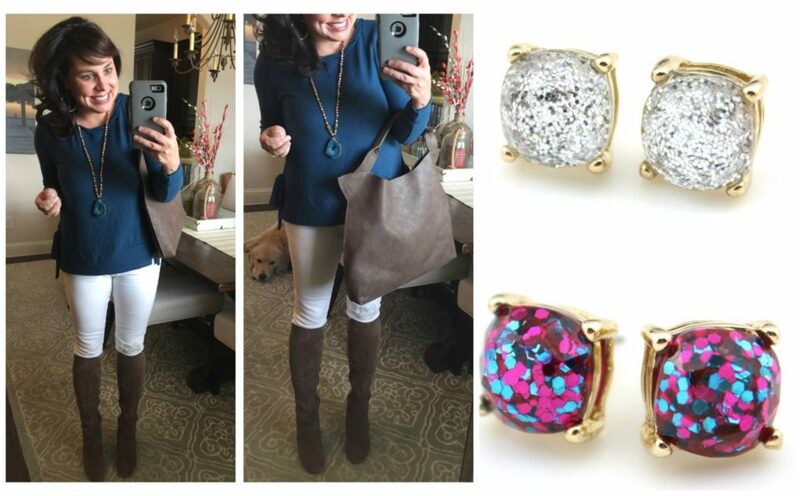 This turquoise sweatshirt and grey jeans combo looks great with both the turquoise and the pink multi studs! 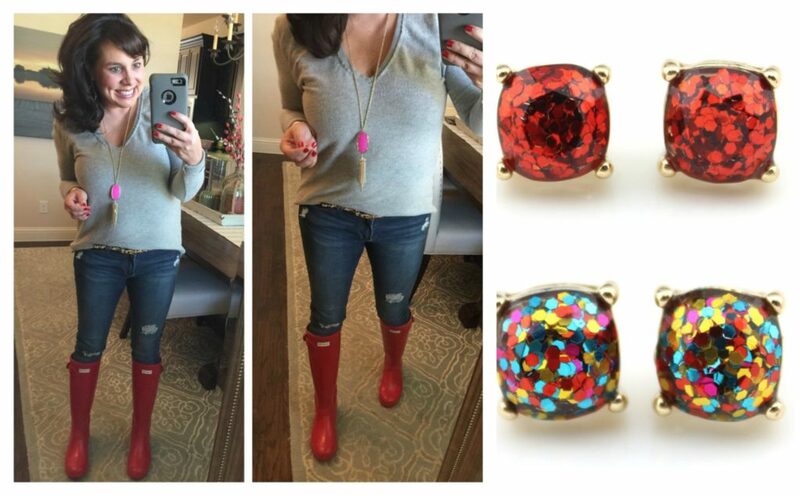 This outfit is already pretty festive with the pink necklace, leopard belt, and red Hunter boots…..but the red glitter or red multi studs make it even more fun! 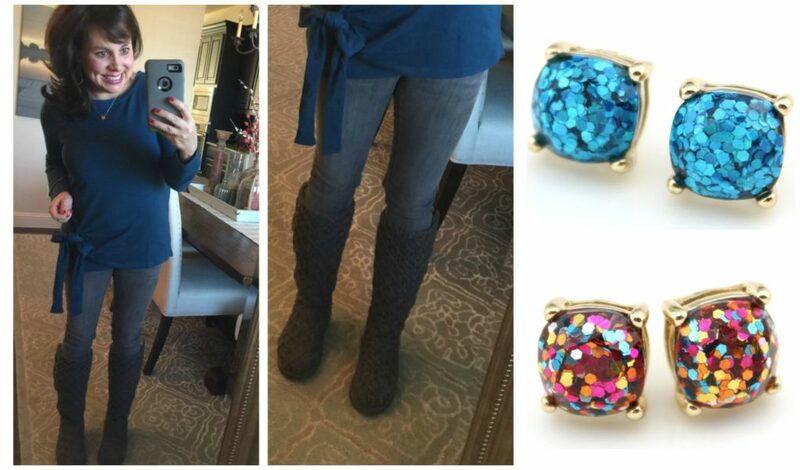 The must have tunic with the sassy over the knee black boots would look great with either the gold glitter or the black glitter studs! This turquoise fleece top is vibrant, and I think it looks great with the mini silver glitter or the purple multi studs. 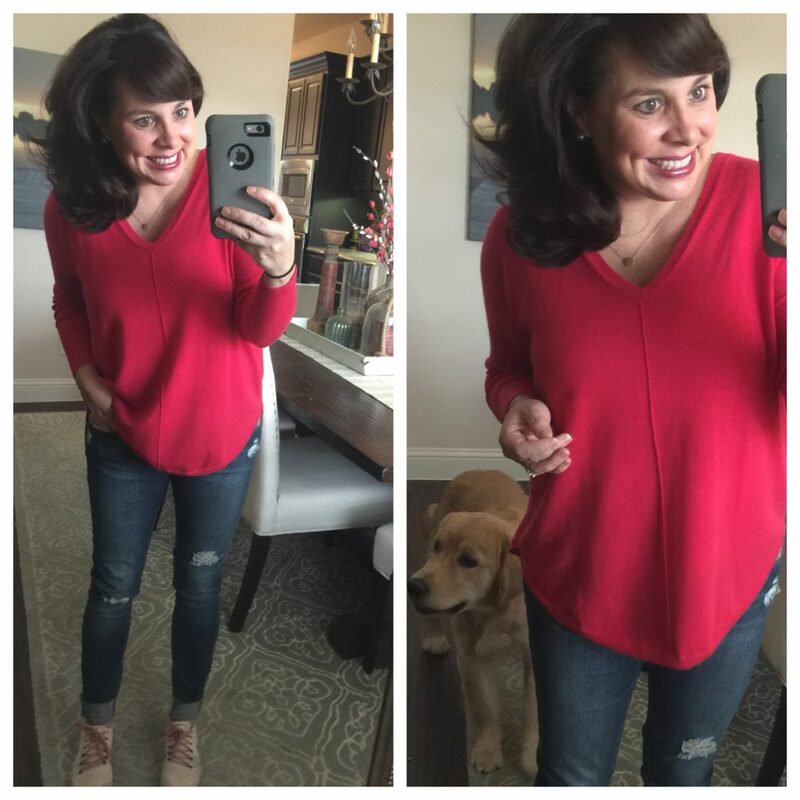 This red sweater has definitely been a GO TO sweater for me in the last couple of weeks, and I know it will be working over time through December! It looks great with the red glitter, the pink multi, and the gold glitter! 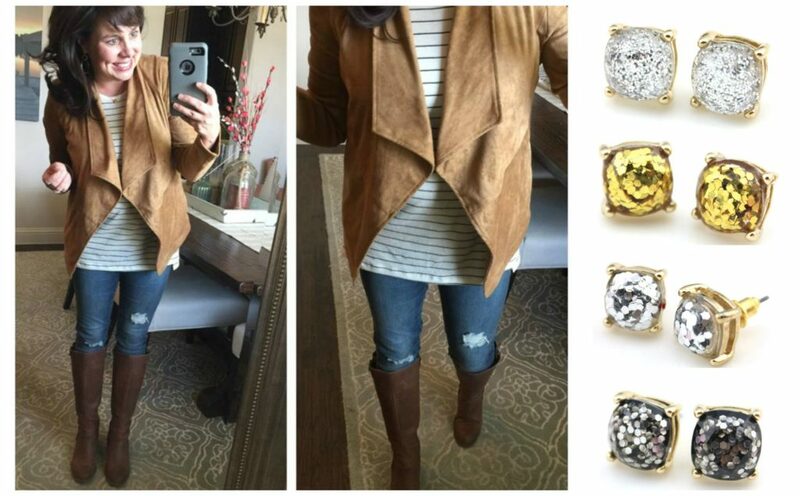 And this neutral outfit looks great with the mini silver glitter, the gold glitter, the silver, and the black! I’m so hoping that this post was super helpful to ya’ll. The holidays are always so much fun, but I know they can also be stressful, trying to figure out what to gift to everybody. 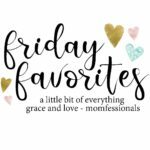 I hope today’s post made it easier for you! A HUGE THANK YOU to my friends at Accessory Concierge for putting these incredible gift boxes together and doing the work for all of us! We appreciate you!!!! 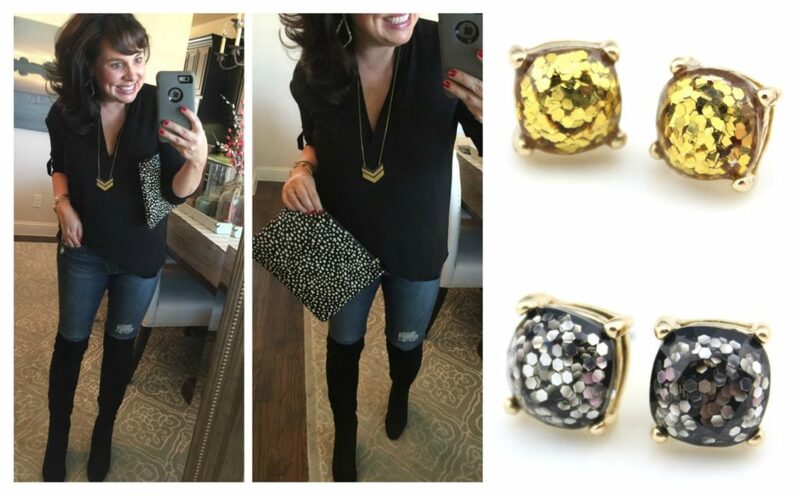 Style Soiree Week 1: KATE SPADE COLOR, PATTERN, AND FUN! 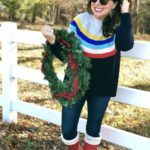 2 CASUAL OUTFITS FOR THE HOLIDAY SEASON! Thank you! Many gifts are now done! I really appreciate the help. 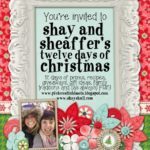 Sheaffer! I am dying over this!!!! How absolutely ADORABLE!!! Hi there! So they may need to check their code. It will work for just one pair of earrings but when I add more than 1 to the cart, it still only takes off $13 total, not $26 as it should for 2 pairs. I’d love to order a bunch but I don’t want to go through the check out process that many times. Let me know if they come up with a fix! Plus, it would be helpful when you clicked on the pair of earrings if it actually told you what the specific color was. Right now it defaults to “light silver” even when you are clearly clicked on “multipink” or whatever. Some of them are hard to tell exactly what name matches the earring, know what I mean? Thanks! Hi, Megan! I texted her just now, and I’m quite sure they will have a fix very soon! 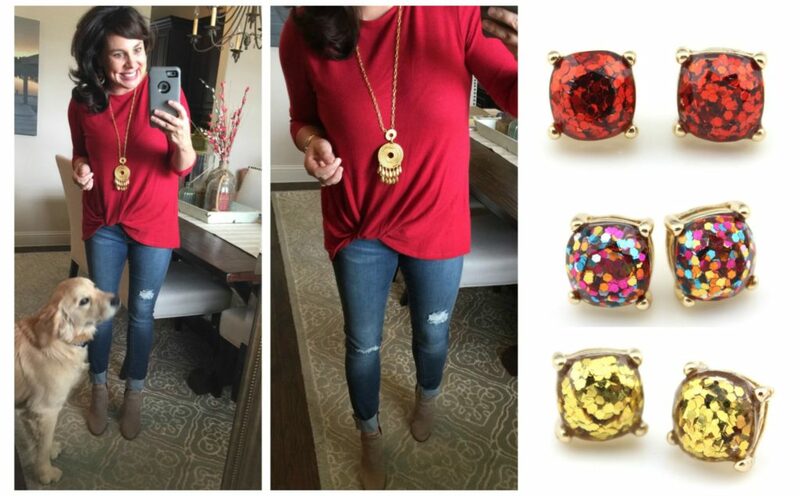 And once you put the earrings in your cart, you will see a closer up picture of exactly what color you chose. Fingers crossing the fix happens asap!!! I’m so excited about the earrings! I have a few already in my cart! Also … I love the pics where your cute pups sneak in! Please let us know when the code glitch has been fixed! Thank you!!! I did the previous card idea you had and all my nieces loved it. I have ordered mine just now and I know I will be the favorite Aunt now! The code worked for multi pairs of earrings. Love it. Thank you for all you do for us. I have a nickel allergy and can’t find any information on the metal make up of these. Any idea what they’re made with? I love the earrings!! Is the discount code for just today or how long can you get the discount? Code glitch is fixed! Ordering for teachers, secretaries, You get earrings, you get earrings, you get earrings. And it takes 50% off my whole order and only $6 for shipping!!!! Great gift idea with the earrings and card! I love when Buddy and Charlie make an appearance in your pictures. I love the look of these BUT do they ever come with silver prongs instead of gold? I am just not a gold girl! OHMYWORD!!! These are the perfect gift…love the whole ‘one and done’ with the gift, card and box!!! Pure Genius! Thank you Sheaffer! You made my entire day!! I just bought all my teacher gifts! You are so thoughtful and sweet. Thanks for always answering everyone’s questions and offering help. I love your blog!! This is SO GREAT! 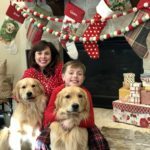 My kindergarten son has Type 1 Diabetes & is in the nurse’s office multiple times a day. I was looking for something unique to get for his nurse & his teacher! These are perfect & packaged so cutely! Thank you for the code! Love this! Also a great gift idea for older teenagers/college students. It’s a hard age to buy a nice, yet inexpensive gift for and I try to avoid gift cards so this is perfect! Hi Sheaffer, These are SO cute! I’d love to get these in multiples but need a little more information about their size….You said they are smaller than the BP ones right? I couldn’t wear those at all – too big for my lil ears 😉 so how do these compare? Thank you and Merry Christmas! The tie front sweatshirt tunic is on sale!!! I got it in pink and blue!!! So excited! !